We see a lot of detailed Halloween costumes inspired by amazing tales and ferocious beasts, but many of them seem to fixate on the scarier parts of the story. Of course a dragon attack would be frightening--especially if you couldn't just search the internet for dragon attack survival tips. 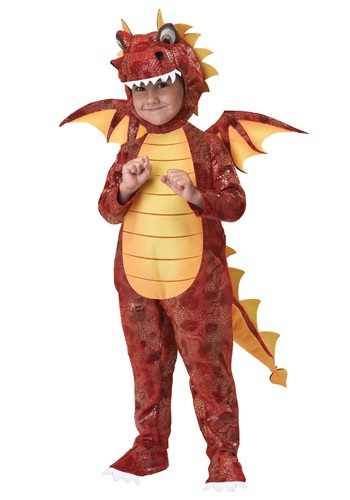 But some of those costumes forget how much fun dragon attacks must have been for the dragon! Hey, we're the last people we'd want to see burnt to a crisp! But if that's how we have to go, we'd rather have the satisfaction of knowing that it really made somebody's day. And one look in the wide, gleeful eyes of this hooded outfit will show you that this scaly dragon feels all warm and fuzzy inside! Though that may not be quite how the townspeople feel, cowering in their flame-resistant cellars. Oh well. It's like they always say: it takes some dragon's breath to make an omelette. That's a real saying, isn't it? You're shaking your head like it's not. Whoops! We must be hungry, or something. From now on, we'll just stick to admiring this spectacular outfit's toothy grin, pointy tail, and cute flappy wings! You can jump in with any adages or axioms that you think might be relevant. The only thing we ask is that you give this impish flamethrower a chance to light up the neighborhood for a night of incandescent trick-or-treating! And if it's not too much trouble, a few toasted marshmallows would really hit the spot.